Hundreds of styles and materials to choose from. A stein is a mug crafted to hold beer. The mug handle has a notch specifically designed to accommodate and secure a shank, thumblift and lid. 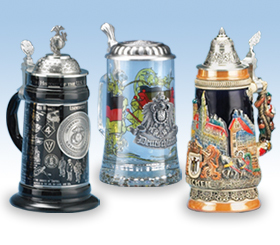 Choose from our broad selection of steins made out of various materials and featuring both traditional and modern designs.